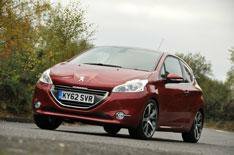 2012 Peugeot 208 1.6 THP review | What Car? Until the Peugeot 208 GTi arrives in May, this 1.6 THP 156 is the quickest version of the supermini on offer. The turbocharged 154bhp 1.6-litre engine can take the 208 from 0-62mph in 8.1 seconds. It's available only in range-topping Feline trim, in three-door format and brings a hefty price of 16,895. What's the 2012 Peugeot 208 1.6 THP 156 Feline like to drive? It doesn't exactly have hot hatch pace, but theres certainly enough to keep you entertained. The best thing about the engine is its effortless flexibility; whatever the situation, it's quick to respond and happy to rev. It's just a shame there's not a more sporty exhaust note to match the performance, but on the plus side the engine is quiet and smooth at cruising speeds. The big disappointment, though, is that the 1.6 THP doesn't handle like a hot hatch. The suspension is slightly stiffer than the regular car's, but there's still a shade too much body lean in corners. The firmer set-up highlights the 208's poor suppleness, because the ride is even more nervous than on less sporty versions of the car. What's the 2012 Peugeot 208 1.6 THP 156 Feline like inside? The 208 comes with a fantastic interior, but the Feline adds several touches to make it even more special. The sports seats are comfortable and supportive, and the touches of leather on the steering wheel and parking brake take the feeling of quality up a notch. The most welcome addition is the panoramic glass roof. It floods the cabin with light, and the blue lighting strip around the perimeter is a classy touch. The interior dimensions are the same as in all three-door 208s, which means you get a decent amount of space in the front, but not such generous headroom in the rear. The driving position won't suit everyone, because instruments are viewed over the steering wheel rather than through it. Some drivers might find that their view of the speedometer is obscured, or that they can't find a comfortable position for the steering wheel. The turbocharged 208s figures look impressive. It's much faster than the naturally aspirated 1.6 petrol version, yet delivers the same average economy (48.7mpg), and virtually the same CO2 emissions (135g/km). However, we feel that 16,895 is a lot to pay for the increase in performance, especially when the handling isn't much better than the standard 208's.